Make your own delicious meals or enjoy a pleasant dinner and good company, in the kitchen; the heart of the home. Window decoration creates a relaxed atmosphere in any kitchen. 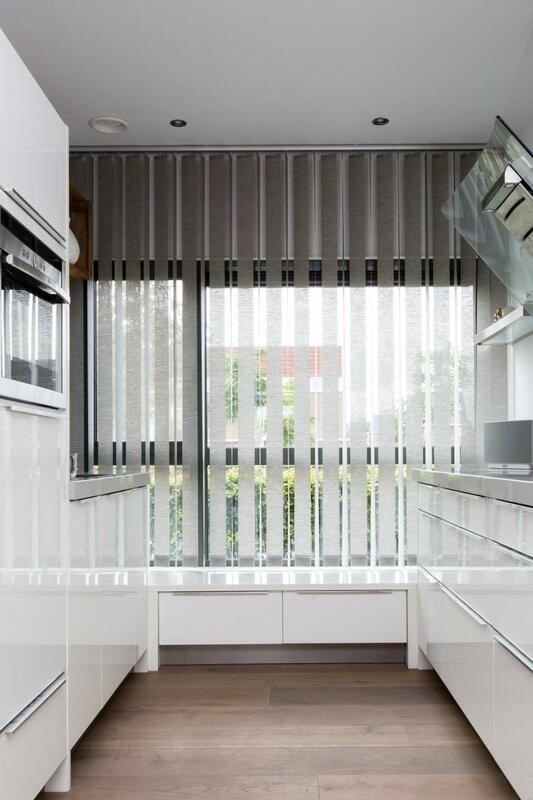 Thanks to the no-compromise quality they offer, window decoration products from JASNO are the ideal window covering in the kitchen. Blinds take up little space, guarantee sufficient incoming light in the kitchen but can also be used to cool or darken the kitchen space. With the option of mounting shutters on a rail system, you can even install our shutters in a kitchen with French windows to the garden! In the kitchen, dust and greasy deposits are a permanent problem. It is important to keep your window covering in the kitchen as clean and hygienic as possible. Window decorations from JASNO can be easily and quickly cleaned. Dust for example can simply be removed from your shutters in just a few seconds with a feather duster or Swiffer. For more stubborn stains use a slightly damp cloth to gently wipe stains and deposits from the louvers. As a result, you will still have enough time to create delicious dishes in the kitchen, while enjoying the attractive light effect! Do you like to cook with organic products or promote a natural and healthy diet? Then you should match your cooking style with the appearance of your kitchen. Why not use natural materials for the finishing touch to your kitchen, including the window decoration? Our folds or folding curtains are produced from woven paper and wooden strips, so their robust and sustainable appearance perfectly matches this healthy cooking style. Shutters and blinds are also available in wood. A colour stain means the wood structure remains visible and emphasises the use of natural materials. You can of course also opt for a paint colour. Fresh air and natural daylight from outside are welcome in the kitchen. A tilt-and-turn window in the kitchen is an excellent idea. Kitchen smells are no longer trapped in the home, escaping easily into the outside air, while a refreshing breeze will help cool you down as you work at a hot stove. A tilt-and-turn window in the kitchen offers numerous advantages. But how can it be combined with a window decoration? Shutters are a perfect solution for covering tilt-and-turn windows. Mount the shutters on the window itself or if the window opening is deep enough, in front of the window frame. Both solutions enable you to enjoy the fresh outdoor air, while retaining the level of privacy you desire. 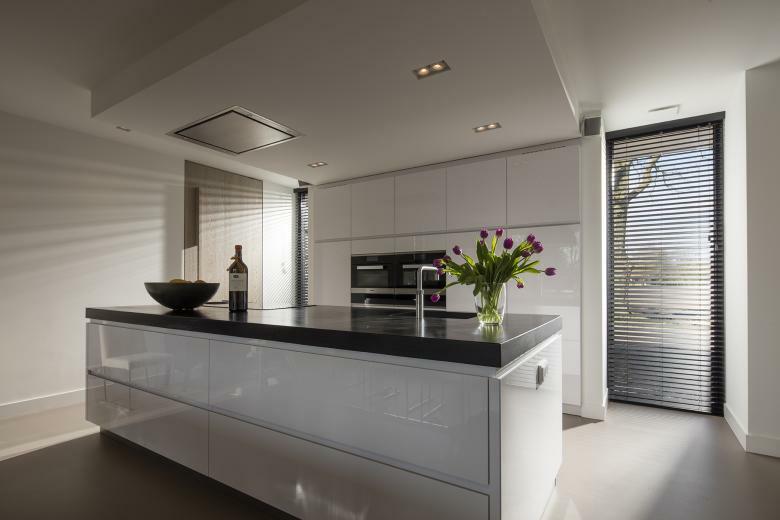 Vertical louvers provide the perfect finish in your kitchen. Swings from JASNO make your kitchen a real eye-catcher. The clean-lined look combined with the unique 3D effect make swings a true designer product. Place the louvers at an attractive angle and enjoy the beautiful incidence of natural light. Or completely close the louvers and keep hungry stares out of your kitchen. Would you in fact prefer normal louvers with no 3D effect? Then JASNO still has the perfect product for you. Click here for window decorations for the bedroom or to find a local dealer. Play with light. Give your house additional allure with window decorations from JASNO: shutters, blinds, folds and swings. Shutters are shutters with adjustable louvers, also known as plantation shutters or american shutters. Blinds are venetian blinds; folds are roman blinds and swings are vertical blinds. Seek inspiration in the photographs of the options offered by JASNO: shutters, blinds, folding curtains and vertical blinds in a variety of living spaces and window types. Or experience JASNO shutters, blinds, roman blinds and vertical blinds for yourself, at one of our expert dealers. They will be delighted to advise you on the shapes and materials available for our window decorations. Download the JASNO app to see what shutters or blinds would look like, in your home. JASNO folds are unlike any other roman blinds you have seen before. Designed by Dutch designers and produced from pure, sustainable materials, these special folding curtains have that special Dutch Design look that will highlight your interior. Folds match our shutters and blinds, and they also match the JASNO swings (vertical blinds). Folds are finished to the tiniest detail, and that fact is reflected in the use of the folding curtains, as well as in their look and durability. Our vertical blinds are the latest addition to the JASNO collection. 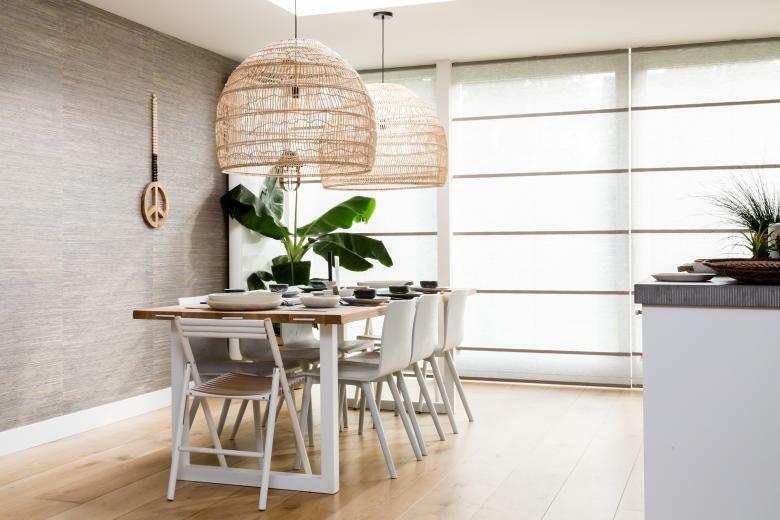 The unique feature of these vertical blinds or JASNO swings is that they can be placed in a variety of surprising positions. By pulling on an operating chain, the louvers are alternately set in motion delivering an eye-catching 3D effect. The louvers can be suspended open, (almost) closed and any variation in between. With a single pull of the operating chain, you can adjust sunlight and privacy in your home or office, with these remarkable vertical louvers. Recently these JASNO Swings have been presented with an iF Award and GIO Award for their distinctive design!